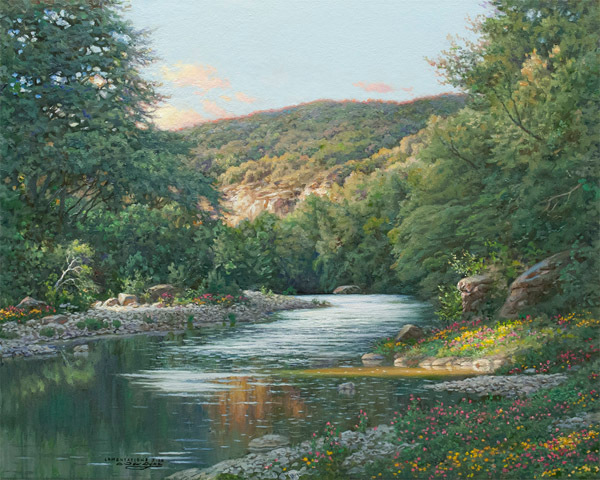 Dyke is a master landscape painter, and he has legions of fans who are devoted collectors of his Hill Country scenes. This image has all the beautiful details that are his trademark. We visit the peaceful river as it meanders through the lush, quiet canyon, enjoying the trees and wildflowers along the way. Can we hear the birds singing? This miniature gem is a perfect image for a small space or a bookshelf.